If not for those damn Yankees the Parliament buildings of Canada would have been built on Baird Street in Corunna, not some distant hill in Ottawa. The story of how Corunna nearly became the nation’s capital is not an urban myth. It really happened. In the year 1823, Lord Beresford led the first of three survey teams by boat up the St. Clair River. Landing at a beach opposite a beautiful island, now known as Stag Island, his party set to work plotting out an ambitious town site. The spot was envisioned as the capital of the future union of Upper and Lower Canada (Ontario and Quebec), with 10 acres reserved in the centre for St. George’s Square and the government buildings. Beresford called the place Corunna. “They were impressed with the location,” said David Pattenden, a member of the St. Clair Heritage Committee. The name came from A Coruña in Spain, the site of an 1809 battle between the French and the English in the Napoleonic Wars. Beresford had served there under commander Sir John Moore, who would also lend his name to the future town, school and township. In the end, geography was Corunna’s downfall: too near the U.S. and too far from the political power of Quebec. “This came on the heels of the War of 1812, remember, and Corunna was awfully close to the American border,” Pattenden said. 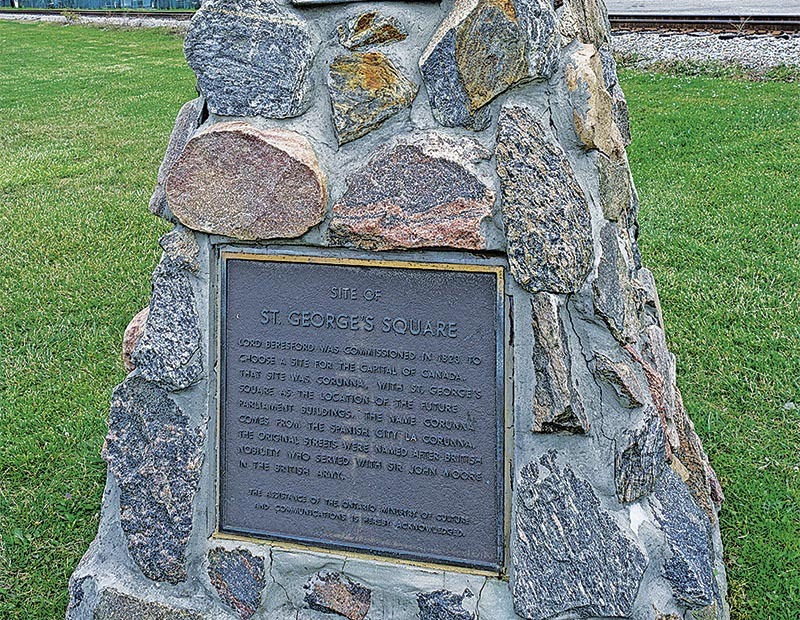 A small stone cairn on Baird Street is all that remains today of St. George’s Square. Kids play baseball on a diamond located where the Parliament Buildings of Canada would have gone. But remnants of the plan still live on in Corunna’s streets. Many carry the names of British officers and buddies of Lord Beresford from Napoleon’s battlefields, including Beckwith, Baird, Fane, Paget, Lyndoch, Cameron, Bentinck, Colborne, Hill and Murray. A few streets follow the specifications of Beresford’s survey, but the diagonal spoke-roads he envisioned radiating out from the square were never built. Despite the capital snub, Corunna grew rapidly after 1850 as British soldiers and their families settled in the area. Within a few years, five hotels had opened to cater to river traffic and ships leaving Corunna’s docks carried hardwood lumber, maple sugar, potash and grain. A school was built, and it was a good one. Graduates included three U.S. congressmen, an MP in distant South Africa and George Proctor, future mayor of Sarnia. Pattenden, for one, wishes Corunna had become the nation’s capital. “It would have changed the whole landscape of Lambton County and southwestern Ontario,” he said.